Hi there Jelveh! My most favorite bead of all is your focal bead #SP 987! It is gorgeous and so colorful with greens, turquoise, black, tan & red. 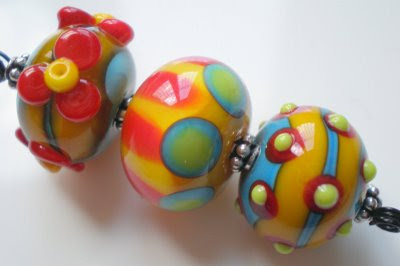 I like focal beads, because others pay more attention to the details in the bead. I like just about any shapes. I also love your set #SP 979.
shapes of beads; lentils, 4-5, depending on size. I am willing to bet that you already know what I am going to say for my favorite shape and number of beads; am I right? I love to design with five chunky rounds! Great pictures and great sets. Unfortunately, I wasn’t home when you put them up. I love the Shades of Fall sets! Too bad they were already sold by the time I got home! Thank you for another great contest for your gorgeous beads. Thank you! The coloring is FAB! Personally.. I really enjoy the different shaped beads like “In My World The Sea”. I would describe it as the “amoeba” designs. Colors.. love lime and turquoise. Sounds like you had a wonderful trip. How nice that your family can all come and join with you. I always love lentils….and I like sets of 5….3 lentils and 2 rounds for earrings!